Abraham Lincoln was the 16th president of the United States. 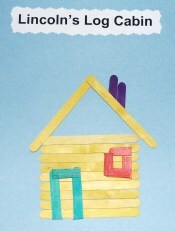 Create a simple log cabin with craft sticks to remember Abraham Lincoln. Smaller pieces cut from the craft stick may "crack" a little but it actually adds visually to the picture. Of course be careful of all rough edges. Looking for Other Activities and Ideas?